Miss Julia is at it again...making me laugh out loud in the car as I listen to the causes she keeps tackling. 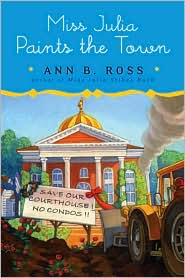 Developers are threatening the town's courthouse and Miss Julia won't stand for it. And where are all of the men going? They keep disappearing, some with the townspeople's money! Miss Julia enlists the aid of Etta Mae Wiggins after finding her so helpful on their trip to Florida to retrieve stolen jewelry in MISS JULIA STRIKES BACK. Etta Mae has certain charms and wiles that might distract the developer from New Jersey. Both ladies think the man is up to no good and intend to stop him in his tracks. I love Cynthia Darlow's interpretation of each character. My absolute favorite,besides Miss Julia, has to be Poochie, handyman of all trades in the town...I had a perfect mental image of the scruffy gent in my mind each time he appeared in a scene.